For parts of the stage, good weather turned into miserable one today, and he race was even temporarily neutralized from km 110 to km 125 along the descent after the GPM of Geraci Siculo, to ensure the riders’ safety, given the adverse weather conditions. But this didn't mean anyone could avoid the almost unescapable sprint finish, nor did it stop UAE from setting up Molano with 500m to go again. This time Belletti was the one to benefit from it. “I am very happy today, firstly because I have repaid the team for the great work done, and, secondly because in yesterday's sprint, taken by the heat, I started too early and lost out. It was a difficult start to the season when I broke three of my ribs in Argentina and I had to sit still for a while. 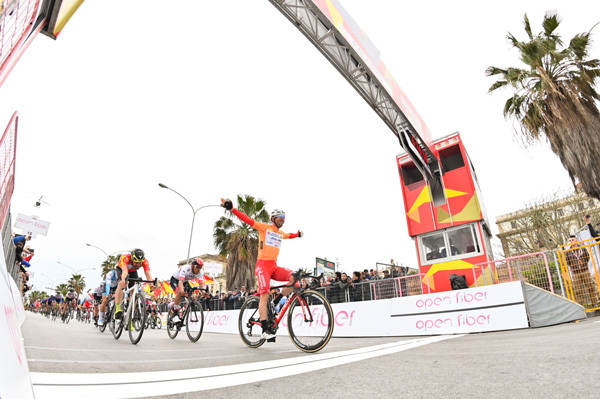 Now the condition improves in view of our great goal of the season: the Giro d'Italia. 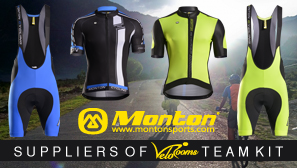 I will lose the leader's jersey but I hope that will be worn by one of my teammates who is aiming for the General Classification”, stage winner and new race leader Belletti said at the finish. We have really nice weather up here north now, and I got out to do a little cycling myself today. However, due to the fact that I haven't really done much cycling in 5 months I spent the evening in agony at the sofa. For consolation I got to watch the third stage of the Giro de Sicilia (recorded via Eurosport player) Southern Italy style, eating pizza. That was not such a waste of time. After a long flat run in the finish featured one long climb from ~30 to ~20 km, an easier section after that and a final snaky climb of some 3 kilometers up narrow town streets. The weather did what the weather often does in that part of the world, that part of the year, throwing water on the streets and making sure the riders did not overheat. The final half of the long climb saw the breakaway caught, a small group breaking off at the front and multiple attacks countered and caught. However, there are two talking points from this stage and if you really like cycling the important one is Brandon McNulty, who jumped off the front of the group (a few key teams totally off guard at that monent), caught a Kometa rider and disappeared into the fog and rain. He basically attacked on the flat with 10 km to go and opened a half-minute lead in a steady steady riding hard time trial kind of way. Then, he blitzed the final steeper descent into Ragusa in best Squalo style, paying homage to the man from Messina? - And it was 50 seconds at the start of the climb. The streets were wet, the turns falling-over-the-cliff type risky and there comes this American dude overtaking the police moto and waving his hands and cursing at them like some minor mafioso late for an appointment with the Godfather. 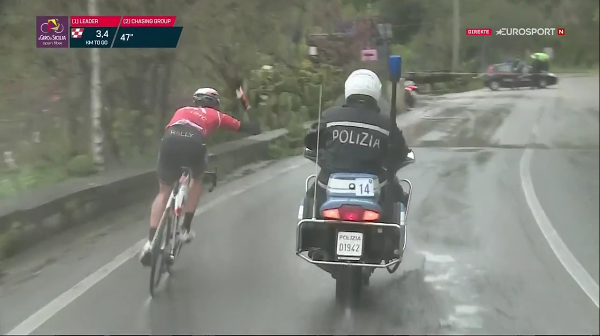 Only Nibali could have done this better, and to prove the point of the bad road condition he overtook a couple more police motos and then one of them actually slid and fell in a turn on some probably even slippier flagstone surface. McNulty continued to power up the climb for his first pro win. From what I have seen of him: he won the junior's ITT in Doha, was 2nd on the ITT U23 worlds here in Bergen, and was good in the Avenir last year - I am inclined to believe it is the first in a long row of victories, this guy can very well be the next American GC rider to shine. The second talking point - what was instantly given a lot of focus in media even here in Norway - was Odd Christian Eiking beating the rest of the group chasing McNulty by punching up the final straight street on the climb through Ragusa. Apparently, the fog and rain and slippery conditions, police motos on the floor, riders falling, sliding and general drama caused Eiking and others in the group tonot notice or forget about McNulty - and Eiking celebrated like he won it. For the usual 4 seconds until his smile turned into a frown, as it always does on such occasions. Of course I am biased as Eiking comes from the Bergen area where I live, but - if you ask me - cyclists are way too restrictive about celebrations anyway: If you're happy and you know it, raise your arms! McNulty is now miles ahead on GC and unless today's effort broke him, Rally should be able to reel in the victory tomorrow. However, Brandon should remember, if it continues to rain - the road is lava! Touch it once with anything but wheels and it will burn you. Guillaume Martin is in good shape, but more than a minute down, and may be the main challenger for the title. This race up Etna can actually erupt! "Get the ! "#¤!#"¤% out of my way or Corleone will talk to your boss and you will be finished! Ciao!" It was really cool to see our youngsters at the front, Juanpe López was climbing with the best and even felt confident enough to try some attacks we also saw Michel Ries at the front of the race following moves a little later and in the end they finished with Stefano Oldani and Lopez in the first group and Ries a little further behind. I'm looking forward to today to see what the boys and especially Lopez can achieve on Etna. 10 km to the finish Odd Christian Eiking had half a minute to the group of favorites including race leader McNulty. When the gap fell to 10 seconds attacks from the bunch began an Eiking was swamped in seconds, working for his leader Martin now. McNulty nullified the first attack, then Quintana went clear, dangling 10 seconds in front of the chasers for around two kilometers when Martin went on the attack, catching Quintana and going uncontested for the win and second place in GC. McNulty never seemed in trouble bringing home his lead in fourth place of the stage, 14 off the winner.